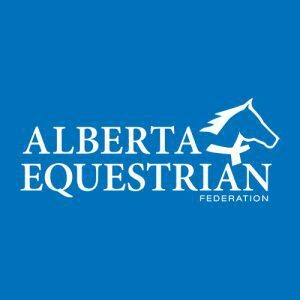 Saturday, September 18th saw the Cypress Hills Registered Horse Breeders group hosting their 34th annual horse sale at the Drill Hall in Maple Creek. Of 70 head that were catalogued, 9 were scratched and 13 passed out. With 48 horses sold in total, the over-all sale aerage was $1625/ head. The top 5 average was $7170 each and the top 10 was $5635. The general consensus on sale day was that horse prices seemed down from previous years. In reality the top 5 average was up $226 a head from last year and the top 10 average was up $30 a piece also. Sucking colts, on the other hand, were a bit tougher sell. 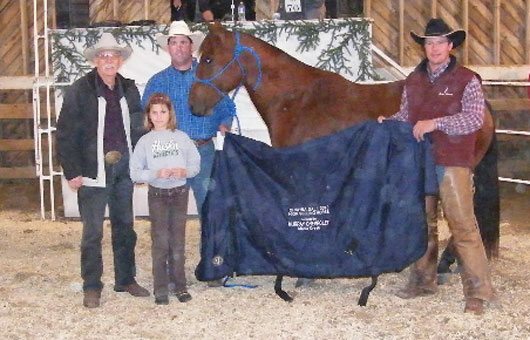 The high selling horse was a 5 year old bay gelding consigned by Brad Osadczuk from Jenner. Brad has consigned top quality, well presented geldings the past several years at the sale. Lot #63, Woodriver Mickey, was raised by the Williams’ at Woodrow, SK. 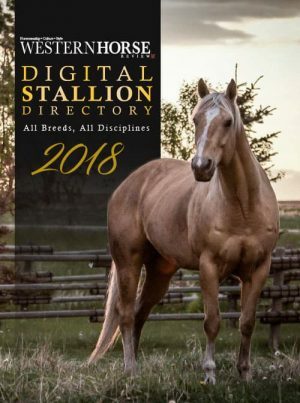 Out of a Razzle Dazzle Doc daughter and by the Dry Doc Freedom Stallion: Freedoms Dun Bar, “Mickey” was an eye-catching, easy moving bay that caught the eye of bidder Roy Clark of Bassano. Roy was able to call the gelding his own after a final bid of $8000. Roy must have been fond of Brad’s other consignment this year as well, as he also purchased Lot #39, EW Woodriver Bar, a 6 year old bay gelding and a 3/4 brother to Mickey for $7250. The Dry Doc Freedom/Razzle Dazzle Doc cross looks like one that works as both geldings watched cattle, handled nice, and had a lot of eye appeal. High selling horse at the sale was Lot #63, Woodriver Mickey, a 5 year old bay gelding consigned by Brad Osadczuk, and purchased by Roy Clark for $8000. 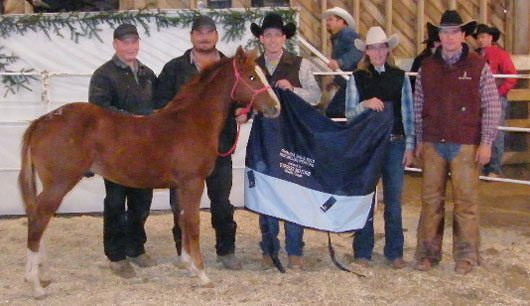 Reserve high selling horse honors were shared by horses of colour, Lot #43, Montana Inca R, and Lot #68, JXL One Dun Salute. Both horses brought $7500. 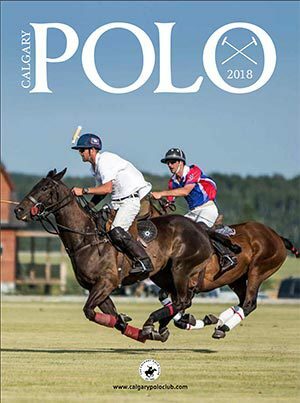 “Incar”, a 10 year old black gelding wearing the brand of Darcy Willis and Chris Sanderson showed his talents on the heading end in the preview. He’d also been used for all kinds of ranch work and appeared to be a pretty even tempered fellow. He’ll now make his home with Jason Wheeler of Medicine Hat (formerly Maple Creek). Lot 68 had a catchy name and a cool look to him. Consigned by the ranchy, yet refined horseman, Jarret Nadeau of Outlook, SK, the horse is headed to Irvine, AB to go work for his new owner, Dave Long. The weanling market at the 2010 sale was down from previous years. Fillies outnumbered the stud colts sixteen to ten. Lot #34, a sorrel stud colt consigned by Brad and Mona Howe was the high selling 2010 model. The big, chromed up stallion fetched a bid of $1075 from the Box Elder Colony. The colt was sird by Docs Dandy Bar Code, a compact bay stallion owned by Ross and Heather Beierbach. 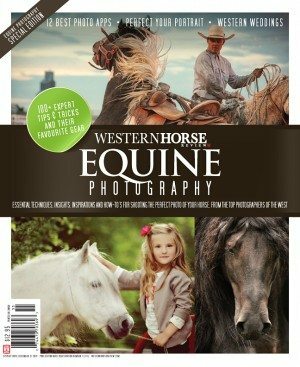 The dam of the fancy foal is Rebecca Te, from the Longmuir breeding program at Empress, AB. High selling weanling was Lot #34, a chesnut stallion, consigned by Brad and Mona Howe and purchased by the Box Elder Colony for $1075.